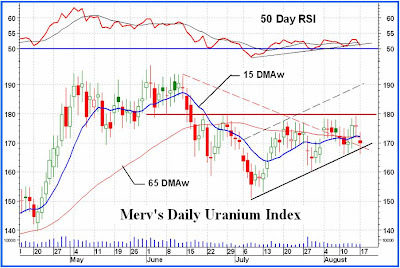 Relative to most mining subsectors, listed uranium stocks have rendered a poor performance, for some years now, inviting examination as to whether this area is oversold. Commodity pricing here moves in a disjointed way, with little relation to variables such as the value of the dollar. Over the past 12 months, the price has churned broadly between USD 55.00/lb and USD 40.00/lb, and is currently priced around USD 41.75/lb, according to UX Consulting; the latest peak was seen in mid-2009 at around USD 54.00/lb. Contract prices have been higher than spot prices for years, at closer to USD 70.00/lb, but have hardly been exciting for some months now, according to industry sources. Canada's Cameco, the global bellwether in the relatively small uranium sector, saw its stock price fall from around CAD 60.00 in mid-2007 to close on CAD 15.00 towards the end of 2008. The stock is currently around CAD 27.00 a share, leaving buy-and-hold investors which bought the stock across 2006 and 2007 deeply in the red. The Nuclear Energy Agency (NEA) of the Organisation for Economic Cooperation and Development paints a healthy growing demand for uranium, especially in the longer term, and the World Nuclear Association reckons that where mine supply was about 44,000 tonnes (about 20% each from Canada, Kazakhstan and Australia) in 2008, demand is likely to increase to 74,000 tonnes by 2015. Most, if not all, of the gap, would need to be filled by increased mine production. Pricing for Australia-listed Extract Resources peaked out in mid-2009, after its Rössing South discovery in Namibia proved to be the story of the year, or two. Namibia's more recent potential was startlingly highlighted by the August 2007 purchase by French transnational Areva for USD 2.5bn of Uramin, for the Trekkopje in-build mine. Berkeley's Salamanca project would be the restart of an old mine, one shut down in 2000 by Spanish state company ENUSA following sustained low uranium prices. Relative to other projects with a similar deposit base, Salamanca rates as very low cost on capital expenditure, with operating expenditure likely to be around USD 30/lb. There are also good performing stocks in Australia's Summit Resources, which, however, is also invested other areas such as vanadium, iron ore and phosphate resources, and Impact Minerals, with tenement holdings in Australia and Africa, a portfolio of six projects with the potential for economic deposits of nickel and significant deposits of gold and uranium. And there are also Canada's Fronteer (whose various interests include 100% of Aurora Energy), and Mindax, but with a diversified portfolio of iron, uranium, gold and copper projects in Western Australia's Yilgarn Craton, and East Asia Minerals, where the main investor attraction appears to be in gold and copper, and London's Obtala, which is also diversified. Uranium remains a big story in Namibia. Major miner Rio Tinto, which has long operated the original Rössing mine, has stakes in Extract, and also Kalahari Minerals, which holds 38.85% of Extract. Good stock price gains have also come from NWT Uranium, which holds 34.06% of Niger Uranium, which in turn owns 15.06% of Kalahari Minerals. Polo Resources has also taken a stake in Extract. Paladin commissioned Namibia's Langer Heinrich in 2007 on time and on budget, and continues with the process of ramping production to what could amount to 6m pounds of uranium a year, at a cash cost of USD 25/lb, by the second half of this year. Further names active in Namibia include Australia- and Namibia-listed Deep Yellow, which has delivered one set of solid drilling results after another; Forsys, proceeding to the mining stage at Valencia; Bannerman, with Etango, Xemplar, West Australian Metals, Pitchstone Exploration, and Toro Energy. Paladin owns 20% of Deep Yellow and 20% of NGM Resources, which holds agreements covering uranium exploration projects in Niger, and metal exploration projects in Madagascar. Mantra Resources holds a uranium resource in southern Tanzania, across the border from recentlyKayelekera mine in Malawi, owned and operated by opened Paladin. 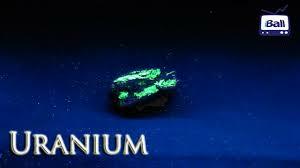 Uranium Spot Price Rises To US$41.75P/Lb.